The Burlington Performing Arts Centre offers the best in performing arts to Burlington, nurtures and supports local presenters and producers, and engages the citizens of Burlington in meaningful arts experiences, animating the community and enriching people’s lives. The Main Theatre is a multi-purpose performance venue. Audience members will enjoy excellent sightlines and proximity to the stage, world-class acoustics and an intimate connection to the performers on stage. This theatre includes a six-storey fly tower and an orchestra pit to accommodate more elaborate theatrical and musical productions. Seating 718 guests, this world-class theatre will delight your performers and audiences alike. The Family Lobby is a unique venue for receptions, exhibitions, corporate functions and civic events. The 5000 square foot lobby is open with a glass roof and is encircled by a balcony level lobby above, creating a unique social setting. Set your scene at The Burlington Performing Arts Centre. 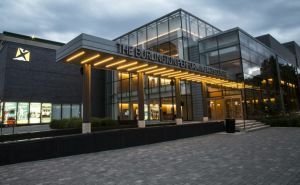 Just steps from Lake Ontario on Burlington’s beautiful waterfront, The Centre is a convenient and spectacular site to host a wide range of functions including weddings, corporate and community events, conferences and galas.